Built in 1587 in Barangay Sta. Ana, Taguig City, it was established by the Augustinian priests under the patronage of St. Anne. 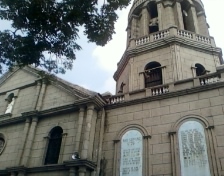 It is one of the oldest churches in the Philippines. It was a little tiring to go to this church but once you get there, you'll soon realize that it was really worth it. This church stands as one of Taguig's pride. Inside, you'll see the beautiful architecture and you can also visit the Museo de Sta.Ana (which you can find inside) where relics and artifacts can be seen. There was a wedding when we visited the place so we weren't able to see the other parts of the church but I can assure you that you'll also enjoy visiting the place. So, go and see the beautiful Archdiocesan Shrine of St. Anne.